...he knows how to treat the ladies. 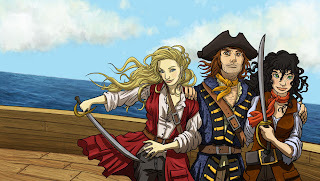 Anne Bonny on the left, and Mary Read on the right. He's quite the lucky pirate. A bit different than my usual style, but this is for a children's book; hence the open area on the other side for text. The original sketch shows Anne Bonny with a gun, but you know kids these days... it's more preferable for a pirate to stab someone with a large cutlass than brandish a firearm around. I actually have to agree! In all honesty, sword/cutlass is TRULY my choice of weapon if there's a zombie invasion. If you run outta ammo, what're you gonna do against those hordes?! Throw the gun at 'em?! Cutlass for the win.